I really had a difficult time with this book. I wanted to like it so much, but it just didn't deliver on the premise. Misty is your typical girl. She is just trying to get through life and find someone who she will fall in love with. She actually comes across as very naive to me. She has an older brother who wants to look out for her always, but when he's deployed, he asks his good friend to do that. Gabe has been in Misty's life for a long time. He remembers when she was just following her brother around. Now, all grown up, he's attracted to her and when her life is in danger, he doesn't hesitate to protect her. Where the story goes a little wonky is between the romance part. Gabe and Misty have known each other for years, but they don't really seem to know each other. It is also strange that they don't have great chemistry – at least for me. Then, to top that off, you have the brother who is angry that his friend is with his sister, but at the same time, there really is only a slight issue and then everything is okay? Plus with the supernatural aspect, this whole story just didn't flow well for me. Overall, it had great potential, it just didn't deliver for me. This is the first book in a new series, but involves the Fierro family that also featured in the Boston Dragons series. I have a feeling that reading those first would give more context to this book. We are dropped in rather abruptly, with little explanation of the paranormal elements, until late in the day. I think that for a reader who chose this for that reason, it is a shame that it is not a stronger feature. For example, modern muses as a concept were rushed for me, but I am guessing are in Boston Dragons (I haven't read them, I looked them up, as I was certain there was background I was missing). The story itself is sweet and has some interesting twists. I was not entirely convinced by some elements, but the ingredients for a good story and plot were definitely present. I think I was confused by the constant change between hot and cold, whether it was Gabe's reactions, Parker's behaviour, or Misty's realisation of her boss's intentions. And why did she end up with nothing after caring for her grandparents? It was mentioned, then ignored. There were some fun scenes too, especially when Julie has a toy party at Misty's! I am sure that the second book will bring more to the story and will look out for it with interest. Award winning author ASHLYN CHASE specializes in characters that reinvent themselves, having reinvented herself numerous times. She has a degree in behavioral sciences and worked as a psychiatric and a Red Cross nurse for several years. She lives with her real-life hero husband in New Hampshire. 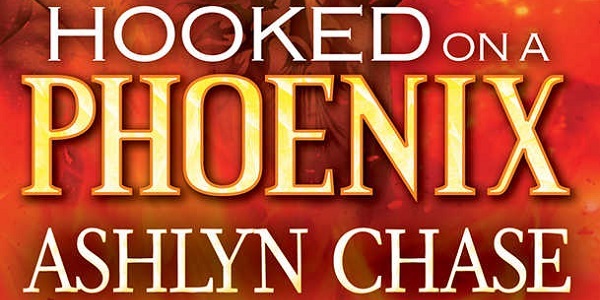 Reviewers on the Wicked Reads Review Team were provided a free copy of Hooked on a Phoenix (Phoenix Brothers #1) by Ashlyn Chase to read and review.